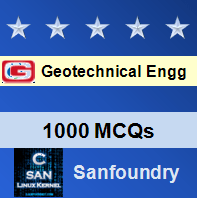 This set of Geotechnical Engineering Multiple Choice Questions & Answers (MCQs) focuses on “Sedimentation Analysis”. 1. In sedimentation analysis, the soil fraction should be of what micron size, so as to be kept in a liquid medium (water). Explanation: According to Indian standards the soil fraction is set as 75 microns to be used in a liquid medium. Explanation: Both the hydrometer and pipette method can be used for taking sedimentation analysis. Explanation: Based on the time of settlement of particles of various diameters it is found that minimum time of 25.8 s is needed for a particle to settle of diameter 0.006 mm. 4. Which of the following assumptions is wrong, with respect to sedimentation analysis? Explanation: In sedimentation analysis, soil particle has average specific gravity. 5. The sedimentation analysis is based on _________ law. Explanation: The sedimentation analysis is based on stokes law according to which the velocity at which the grains settles down depend on shape, size, weight of grain. Explanation: Since ɳ=viscosity of water/liquid, it can be affected by temperature. Explanation: The particle smaller than 0.0002 mm is affected by Brownian movement and stokes law remains no longer valid. 1 poise =0.1 NS/ m2. Explanation:The constant value of unit weight of water/liquid is taken as γw=9.81 kn/m2. Explanation: The viscosity of distilled water in sedimentation analysis is taken as 0.00855 KN-s/m2.